Spring has just sprung and the temperatures are really starting to heat up here in Florida. Wouldn’t it be nice to make it through this entire cooling season without any AC issues? This is possible if you follow these simple tips we’ve listed below. It’s not hard to have a high performing air conditioning system as long as you give it the right care. It heats up quickly here in Florida, so if you’re already facing problems, then you might be a little past the point of preventative care. If you need a professional AC technician in Palm Bay, FL then you can rely on our team here at Next Generation Air & Heat, Inc. for all your air conditioning services. 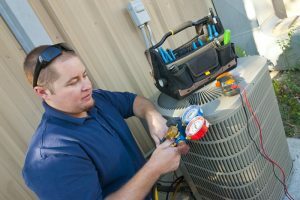 We’re a reliable and responsible team dedicated to keeping our customers cool! Here are a few simple ways that you can keep your air conditioner in top shape this year in Palm Bay. Do you change the filter in your air conditioner as often as you should? If you’re a homeowner in our area, it’s a great idea for you to change the filter in your air conditioner at least once a season—maybe more if you’re really leaning upon your air conditioner to keep you cool in the face of our balmy heat. We want to take a second to note what your air filter does—it’s something that’s often misconstrued. The air filter in your air conditioner doesn’t actually clean the air in your home. If you’re looking for this, contact one of our technicians about indoor air quality systems, instead. An air filter protects your air conditioner from dirt, dust, and debris that’s commonly found in your ductwork. It needs replacement every few months to prevent any clogging. If it does clog, it blocks the airflow throughout your air conditioner. It’s easy to just live your daily life and let your air conditioner become a fading part of the background. This summer we want to encourage you to do things a little differently. If you notice that things are a little “off” with your air conditioner, make sure that you contact a professional from our team as soon as possible. You rely on your air conditioner so much throughout these hot Florida months that procrastination in any form can quickly lead to a system breakdown. If you haven’t already scheduled preventative maintenance services, now is the perfect time to do so. Having a professional air conditioning technician service your AC unit in spring will help your air conditioner perform strong. There are so many issues that your air conditioner can face that aren’t always readily apparent. You need a technician with a trained eye to spot the problems before they become debilitating. Contact our team as soon as possible for a maintenance service appointment. Make sure that you give your air conditioner a shot at success this spring. If you follow these practices, you’ll have quality cooling all year round. Contact Next Generation Air and Heat to schedule an appointment. It’s Time to Prep Your AC for Spring!